Firstly, each individual’s definition of art is so subjective that I’m not going to attempt to define it here. I’ve been told that it can’t be art unless there’s a masterful control of technique demonstrated; at the same time, if it’s nothing but technique and it doesn’t ‘touch my soul’, then it isn’t art, either. But what touches the soul of an individual differs from individual to individual – therefore how can we make a work that hits all the targets across a broad spectrum? The short answer is, we can’t, and we shouldn’t try – because it would become a near miss for many rather than perfect for at least one person. Each individual’s soft spots will have been moulded by their experiences and history; our biases are nurture rather than nature. Therefore, the first consideration is that at very least we as the creator must be moved by our own work – moved enough to create it, moved enough to feel at least some sense of pain/ longing when faced with the possibility of selling the only copy. This brings me to the next point: fundamentally, photography is thought of as a derivative work; it is not a primary medium in the same sense a painting is a primary medium. This results in two consequences: firstly, photographs are normally reproducible in an identical, indistinguishable way: if you can have two of something, the value of exclusivity will instantly halve (or worse). It doesn’t help that photographs are very easily creditable by anybody; it isn’t a technically or physically difficult process anymore. (That said, doing it well is no easier than it has ever been – the rules of composition and seeing have always transcended time and equipment.) Beyond that, the medium is always a representation of the real world in the sense that the artist does not have the freedom to create the impossible with purely their own skill and imagination; yes, you can move the objects around in a still life, change the lighting, and then go to town in Photoshop, but most would argue that it’s more difficult to paint that than manipulate it later. I beg to differ: to manipulate things in PS is easy; but to do it convincingly and well is actually incredibly difficult. Is there an enormous chunk of skill and at least a dollop of art in good retouching? Absolutely. Wherever a subjective judgement has to be applied – in how much brush to use, or whether to use method A or B, and there are no right or wrong answers – just perceived results – then you can argue that there’s something beyond just craftsmanship. In fact, I would argue the converse over painting, drawing and other media where the artist has total freedom: photography is in many ways confined by the laws of physics. There are things we cannot physically do, but painters can; variable forced perspective in a single frame, for instance. It’s difficult even to do that convincingly in Photoshop. Lighting, camera position – these things are becoming increasingly feasible with accessibility of new technology such as low-cost helicopters. Being constrained (mostly) by the physical forces us to get creative; it forces those of us who want to tell stories to find a way of doing it within the realm of the possible. Beyond that, there’s frequently also a timing issue: a painting can take many years to finish, but still represent the same instant in time. A photograph with a shutter speed of 1/1000s can only ever represent that 1/1000s instant in time – not before, not after. That moment is fleeting and transient, and if that’s the only moment that represents your story and you miss it – too bad. Bottom line: it is a very different skill set, much as how lost-wax casting sculpture is different from charcoal drawing. Neither is more valid or real an interoperation of the subject than the other – the suitability of the medium depends only on the objective of the creator/ artist and their skill at applying it. The same goes for photography: there are some ideas best represented with the minimalism of a watercolor painting; but sometimes you also need the intensity and perceived realism of a photograph. Notice how I didn’t say realism outright, but perceived realism: all photographic reproduction media attempt faithful presentation of an image, but ultimately the source image itself is a reproduction of something: so it can never be reality. One of the challenges is that our brains perceived this as reality because all of the visual cues are in place, and it’s so similar to the way we normally see the world – if it appears to be close enough, then it probably is. Even if the reproduction is ‘coloured’ – think instagram filters – our brains can still separate out the bias from the base content; why not go the other way and seek out as much reality as possible? That was my personal objectives for the Ultraprints: they do not attempt so much to be photographs in the traditional sense, but immersive vignettes. (You may find this article on ensuring the art/ purpose transcends the process interesting.) It’s one of the reasons why they tend to work better with larger, more detailed scenes and less so with tight closeups or strong depth of field isolation; these situations are simply not immersive enough to make full use of the medium’s resolving power. I would certainly argue that a properly executed Ultraprint – both subject matter and process – is art, and not just because I’m producing them. Derivative work or not, art makes you stop, think and observe: and that’s just what the prints do, providing I get the subject matter right. And that’s much more difficult to accomplish than the technical part of the process. You could actually go one step further than: if only one print was ever made, and all source files or negatives deleted/ destroyed after that, what would stop it from being more exclusive than a single painting? In short, nothing. We have eliminated the argument for erosion of value due to reproducibility. Would I ever do this? Probably not, but I will (and do already) limit the number of copies of any image in circulation. I believe in doing this both to protect the future value of the image, and the investment of my buyers. But I won’t delete files, nor will I create images specifically targeted at a crowd with the aim of financial gain: they have to pass my personal approval first. I should always be my won strictest critic, at least where personal/ art work is concerned. If not, then I feel a lot of the integrity in creation is lost. The whole argument for integrity in a photograph is a tough one, with many fine edges and grey fuzzy borders; photojournalism requires no removal or addition of elements that weren’t originally there to begin with, but alteration of contrast, color and tone both locally and globally is ok – as if that doesn’t affect the perceived image. 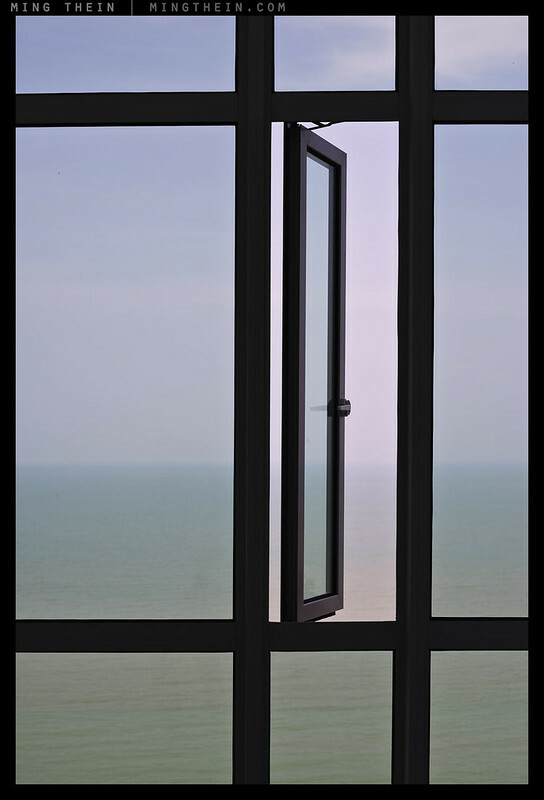 The sky is the limit for commercial, and usually things tend to go too far, to the point that the presented interpretation reality isn’t physically possible anymore. I think if it’s obvious this is fine, but when it isn’t and most people can’t tell – it does feel borderline dishonest. Frankly, the whole act of composition itself is selective exclusion, and affects the perceived image. By this logic, either all photographs are all integral, or none are. But we could very much say the same of every other self-generated art form: they are born of the artist’s interpretation. They too are derivative works, whether they’re derivatives of nature (e.g. portraits, landscapes) or something else – e.g. a painting inspired by a photograph or vice versa. Is a painting of a landscape garden the creation of the landscape architect or the painter? Similarly, is a photograph of a building the creation of the architect, or the photographer? I’ve been told before that because every single angle and sight line is considered by architects when designing a building, my composition isn’t original: it already existed in the mind of the architect somewhere. Except, there’s no way they could envision what would be built afterwards, or the quality of light on that particular day, or the way a solitary cloud in the right place completes the composition when using the right angle of view. Inspired by? Certainly. Created by? Certainly not. Can you identify the influence? I’m sure there is one, but I can’t for the life of me figure out who it was. I think it’s because the appearance of a photograph is far too close an approximation to reality that causes society as a whole to have a problem with accepting a photograph as a pure art form. Compounded with that is the ease with which anybody can make a – usually mediocre – image. The lack of understanding of just how much thinking must go into the creation of a visually and conceptually coherent image is partially to blame; those who understand the industry and process – I’m looking at you, creative agencies – are equally guilty for only ascribing value when they have to bill clients for use. We live in a visual, interactive, media-saturated world. Most people are net content consumers, not creators; this means we are influenced more than we influence – even somebody with output as prolific as myself will probably see far more material than he will ever produce in their lifetime. The bombardment is constant, conscious and subconscious – what we don’t acknowledge sticks, too. A good example would be clouds: my current interpretation of them is heavily influenced by Rene Magritte; but my awareness of him came from the 1999 version of The Thomas Crown Affair in which The Son of Man played a starring role. And I only watched that because I liked Pierce Brosnan as James Bond. I think the chain of causality is fairly clear – though at the same time it’s not at all obvious why James Bond should have influenced my predilection for and the way I photograph clouds. It would, however, be very different if I just made photographs that looked exactly like Magritte’s paintings, or worse, paintings – then there’d be no originality at all; my ‘creation’ would be recognisable as one of his, not one of mine. And there we have another important realisation: you may well be the first to create something (unlikely in the art world, more likely in areas where the technology or methodology didn’t previously exist), but you’ll only be remembered for it if you are publicly and popularly associated with it: that unfortunately means he who shouts the loudest (or is most visible) has priority of mind amongst the audience. Asserting your copyright is a matter of both registering it, but being able to defend it – and if you don’t have deep pockets, then visibility is your best bet. Thankfully, social media and the internet makes it easy – or relatively easier. Congrats. An article which nicely sums up my views. Btw I think the red cord image draws on Eggleston’s light/red ceiling? Thanks – but no, that was not intentional at all. With any art there is a time factor in developing a personal or distinct idea and approach. There generally has to be some pre exposure or learning involved regardless of how long it takes for you to reach meteoric artistic stardom . Avoiding “derivative” work in the development of any art practice is like learning to swim without getting wet. Art is a language, although often abstract there are certain social agreements that do allow us to evaluate and chart its progress. History essentially dictates this. We learn from the “masters”. Artists often attempt to take from where thy left off or rebel in a completely different direction. Regardless; it is aware of its history and so any artistic understanding and evaluation takes this history into account. There is also the need for some technical transfer, even to act as a base for the development of new techniques. Technique is essential to executing ideas, so we often see movements happen where artists work with an air of collective consciousness. We always learn from each other. its just like any type of work, If we attempt to dig a little further and get inside something you are more likely to find something that is truly yours. There is nothing wrong with having influences, its just the manner and respect with which you deal with them. I think of Art is just one big conversation where you have to say something interesting about yourself. At the end of the day some people are more interesting than others. Not at all, but its a base. A base that would likely still have some resonance in later more developed and orginal works. One could take the perspective that if something is not derivative, it is not art. Why? Because, according to this view, a work of art must connect to a tradition and the artist must earn her position as an expositor of that tradition. Otherwise, it’s just unschooled “self-expression.” Buy why should anybody be interested in another’s “self-expression?” Such expression is an inevitable trace in art works, but any art worth considering is not about its creator. It’s about all of us, or about the tradition and craft of the specific art form. FWIW: Beethoven, up to the end of his life, copied out works of composers he admired in preparation for his own projects – Mozart, Haydn but most especially Bach. A photographer can’t do the same – for one thing, the technology washes it all away. Were could one find the paper Paul Strand used for his prints? Oh: the pictures to go with this piece are an absolute gas! I’ve replied here on this topic before on the subject of architectural photography as art. Call it what you like, the architect is the main artist. The architect imagines, designs, considers materials and tasks and team, overcomes obstacles, adjusts the design, considers costs and materials and weather and tolerances and stresses, and gradually over some time his vision takes form as a work where before there was no work. The photographer comes along and in a minute all by himself takes a picture of it. Sure, a wide angle lens is used so that we have all these lines and juxtapositions and shadows and lighting. That’s a value for sure in a nice picture. But the subject was a man made one implemented by someone else, was already there when the photographer came along, and was something that somebody saw before the photographer did. Question: If a photographer takes an artsy shot of a Botticelli painting, is the artist the photographer or the painter? Is an edgy black and white shot of The Thinker the work of Rodin or the guy who whipped out his phone and took the shot? I appreciate a well done shot of a building as much as anyone, will even try to do one myself. But I am humbled by the imagination and skill of others. Another thought provoking article Ming. My own take is that originality doesn’t matter, especially in today’s social media world where you get feedback so quickly. If you’ve strayed too far to plagiarism then people will let you know. At the same time if your shot is in the style of someone and people like it then also fine. As an example take your shot of Lake Hawea – someone on Flickr said a ‘Modern day Ansel Adams you are Ming’ – by saying that it implies you’re not being original, but does it matter, no as its a good photo on its own. I’ve concluded from all the discussions on art that you can come up with all the theories and understanding you want, but in the end people will buy what they like and the only way to understand that is to test the waters. No doubt your gallery site will help with this in pure numbers – i.e. sales and I think your approach of being your own biggest critic will shine through in the long run! Agreed, just be Ming Thein and people can judge if they like Ming Thein’s photography 😉 . To be honest a fair few artists must have had that slight arrogance in their work? I think it’s good to initially over think the issue – it makes you really appreciate the simple final answer. I wouldn’t have thought the answer is that simple if we didn’t have these discussions here…. the influence i see in the last picture is the kiss, max ernst. he used a painted string falling on the picture to create the lines, to fulfill the surrealist aim of making the subconscious emerge tru random generated drawings. obviously only the incipit was random. it was nice to see hiroshige amongst your inspirators. i’ve always loved his perspectives. Ah yes – Ernst! Thank you. Very much enjoy your website for a calm analysis of equipment and ideas. About ” white cable on red chair”, perhaps the unconscious influence of Man Ray, Harry Callahan, and painters Mark Tobey and Jackson Pollack? Not bad company. To me it’s quite simple. If the artist declares something as art – it’s art, derivative or not. If it’s good or bad art is the subjective part. It is the role of the viewer and critic to understand that art in the context of art history. If you don’t have a handle on the art history of the medium you will never be able to understand the relative merits of the work and will just relate it back to the act of seeing. Lets take the picture of the red chair with white wires as an example. Ming considers it art therefore it is art. Anyone with a handle on the history of art photography will immediately draw comparisons to Eggleston’s ‘Red Ceiling’. Is Ming’s red chair photo technically better than Eggleston’s red ceiling? Undoubtedly. Does that make it a better photograph? Yes. But in an art context, no. That doesn’t mean ‘red chair’ can’t be enjoyed and appreciated. We just have to understand why Eggleston’s ‘Red Ceiling’ is important in the context of art history. If I spent a week in the NYC subway system documenting the gritty reality of life – I must at the very least pay lip service to the 1930s works of Walker Evans and 1980s work of Bruce Davidson. If I don’t know about the works and independently come up with something that builds upon their legacy, I got very very lucky and can blag it – I may even be a genius. If I fall short (more likely) and start wonder why no one cares about my work its because I was a bad artist for not knowing my history and how and why the bar was so high to begin with. It’s the same for any art medium. The fact that most photographs are not created by artists and are informal documentary in nature and thus very closely related to the act of seeing and remembering is what holds back the re-education of the gaze. The least we must do is respect the history of the medium and try to build upon it. That would make sense – but it is necessary to know history to decide if you personally like it or not? I’m not arguing whether the red chair is better or worse than red ceiling, but I’d like to know why you think it is (or isn’t) – especially given that I’d never seen red ceiling prior to producing red chair. Revolution is just evolution in fast forward. Eggleston also became known for his excellent prints. He had produced very expensive and high quality dye transfer colour prints of his work. No one, other than advertising photographers, was as doing this at the time. I guess this also made his work hard to reproduce. The same way the trend for fine art photos is gigantic – so they are hard, if not impossible for all but the seriously committed , to reproduce. In the same vein, you are onto something with your ultra-prints. , are as you say derivative.Since thought,sensibility,science ,math and yes ….art are manifestations of our mind then all these too must stem from that singularity.So everything known stems in one way or another from that and if that was all there was to truth we would have no need to ever consider anything again for we would have found the only original thing and hence ultimate truth. But there is a problem.If everything can be reduced to a “what” it begs a question.Why. Why would a singularity have to create iterations of itself with such profundity? And in that question the what became why and absolutism became uncertain and …science becomes art. it seems to me that painting,literature,photography ,in short, all the “arts”are superficially catalogues of the whats but it is art when it asks why-even if only subliminally. Why take a million pictures of a million buildings?Why not just take a picture of a bunch of buildings and have a single brick in the foreground and make a definitive statement? Absolute truth. Buildings are made of these, No need to take anymore pictures.Right? Architecture explores geometry,why do people takes shots looking up at skyscrapers -because usually all we see is our feet.It’s a new way of seeing and it asks why.All forms of examination of photography are valid….equally.Are my arms more important than my legs.Ask that to a legless man in a burning building.Context not absolutism. Ultimately when we ask is there anything original or is photography art are we not just seeking justification and validation of our work and hence ourselves? Isn’t the very question flawed? Doesn’t it show complete lack of understanding of the unity of everything.Must our heart and brains constantly be in competition?.We need both. So….Is Ming Thien an original ?Indeed without question both as a photographer and a teacher. Double first in a first class category IMO. As an example,tonight, a person from Singapore posted 3 images on Steve Huff’s site.They were beautiful but he can never be original. It’s just Mingology. Interestingly he is on wordpress too.Nom de guerre old boy? LOL. I absolutely believe in asking the why question – without making some attempt to understand it, we are no better than animals or robots who do and produce what we are expected or told to. The work never gets better nor can it rise above the position of being a derivative work in itself because no consideration was given to its purpose. It has no purpose and can therefore never transcend being reactionary. You’re right! Why is the big question that art should address and attempt to answer. Your Red Chair influence? One Infinite Loop hacked from Mobius but only if shot on an iPhone. Yours stands on its own with that finely modeled shadow of the wire, a double Mobius Strip. As far as what Art is, I’d say that Art is a meditation on Art. a rare new painting is encountered we take the time to explore if it’s any good or if in some way it resonates with us. somehow is a cheat. No obvious workmanship in Found Images and most are snaps, a good one a lucky shot. Then if you do stumble upon a Performance Piece of Found Art at your local gallery, is a painter’s messy palette lying on a wobbly table with jars of brushes and squeezed aluminum tubes of color and-and other studio bric-a-brac really worth a look? Trite, but oddly a photo of that could be interesting or even timeless. The photo is the better souvenir of a moment now gone. The other half, the Studio photography approach like your fine watches is more of a meditation on style and precision. But we’re swamped with that too, not art but advertising is the message and back to the dilemma in photography, too much of it and much too much of it is boring. be the best iPhone shot ever. Congratulations on going much much further with Ultraprints. Where do you see your work going now? Sorry for the loaded Question. Fine where it is though I was also thinking of a simple idea, an exploration of Time. Seriously though but practically speaking without having to do much research or agonizing, why not more difficult shots at twilight, at night, now with sensors so capable? Because there’s still an enormous image quality compromise unless you’re using a tripod, and you’re back to being unable to make Ultraprints again. Acuity goes out the window. Besides, to say I don’t photograph at night isn’t true at all…look at my flickr page. There is a nice analogy of photography to photography or vice versa, simply because it too is an art form. For one thing, the whole issue of “derivative” versus original haunts all jazz musicians as well, not to mention personal style. If you listen to Charlie Parker or John Coltrane you know that they evolved their form from those who went before, but they were both extremely original and did things that had never been done before or since. Moreover, they cannot be copied at all because it is so obvious, so you hardly ever hear anyone trying. The book was closed once they died. Always full of surprise and unusual patterns that could only come after complete technical mastery, a result of thousands of hours of practice and experimentation. And yes, without violating a certain minimum level of structure and conventions that are recognizable. Odd because Coltrane followed Parker (who many did try to imitate), but it’s hard to see any similarity between the two. Sound patterns, improvisation on melodies and new rhythms. Now classics, of course. The whole idea of photography representing reality versus painting as pure creativity is also nonsense. Picasso dismissed that with one easy encounter. When asked at a cocktail party once why he didn’t paint anything that represented “reality.” You mean like a photograph? Yes! So, he asked the guy if he was married, and photo of his wife with him. Looking at the photo in his hand, Picasso merely said, “My, what a small wife you have.” He could have said more. Does she always look like this, or does she look different in other photographs? In fact, whether in person (is even that reality?) or in a photo, she never looks exactly the same. The eyes and mind lead to that illusion of stability and continuity. The impressionists etc. etc. etc. presented a perception of things that could only be experienced as if for the first time in their paintings. But yes, unlike a landscape photographer, say, the painter can add a barefoot maiden at just the right spot in the wheat field. And yes, all artists in any field also have to wrestle with the question “Is this art?” Still art? If not, then what? “Snap-paintings” to draw another analogy? The only (still controversial) definition of art is whether or not someone has allowed it to appear in a museum or gallery of art. And as we know, the French impressionists were not allowed soon or too easily. Now classic art. I think photography in that sense still has not had its day, though whether it ever will or not, though its own mass adoption will land up being both blessing and curse – lots of exposure, but also too much perceived ease of access and associated devaluation. Maybe that’s why a lot of the current crop of ‘art photographers’ feel the need to create the entire scene to further distance themselves from everybody else. Upon reading your article two things came to my mind. Firstly a short story by Jorge Luis Borges, “Pierre Menard, author of Quixote” in his book Fictions. In this short story, Borges describes Menard’s attempt to create a novel which would reproduce page by page, line by line, word by word the work of Miguel Cervantes. This of course would not be done simply by copying Cervantes book, but otherwise trying to arrive at the same novel from Menard’s point of view as 19th century’s man. It’s best to read the story than to rely on my description, because Borges cleverly makes you wonder about the idea of originality in art and that of reproduction. Does the way how a work is reproduced matters? Does putting little effort into making something makes it less meaningful as a work of art? The second thing is a sentence commonly used by Álvaro Siza Vieira, a Portuguese Pritzker awarded architect, when he talks about architecture: everything is invented we merely reinterpret what was “left” to us. In the midst of this re-digestion we are bound to making variations of the same typologies. Hi, Ming. For me any kind of art is something that causes emotional reaction, strong enough to stop that momento in time – very subjective, anyway. – AND a fluid adaptation to the medium – talent can be the seen as how ease someone develop specific skills, pictorial, musical etc. The influence question can be a bit of both – in this case, I haven’t seen that particular image, so it cannot have been an influence. You seem to agonise too much whether photography is art, perhaps not only photography but also digital paintings where a work can be perfectly duplicated. The latter affects me as a digital artist. Why not look at it this way, there are so many people on this earth, for each person who say your work is not art, is at least one other person will say it is and love you for it. The idea is for you to surround yourself with the latter. I saw jackson pollock in your headphone piece. great topic with very interesting questions. i have no comprehensive answers. I think what many current fine art photographers demonstrate (and i don’t necessarily agree with this) that it is not seen as “enough” to capture a piece of reality (including the art of others such as architecture) with a camera (especially a digital camera)…that to become a “full” artist comparable to a painter or sculptor or musician, etc the photographer must not only capture an image but create the circumstances of the image (see cindy sherman, etc) in essence becoming writer/director/photographer. Another example of “going beyond” is somebody like the photographer (the name escapes me) who transformed a truck INTO a giant wet plate camera…and the resultant images are now perceived as “complete art” because of the effort involved in the entire enterprise and the effected “old fashioned” look of the images. hm. not sure if i agree…or if it’s entirely possible to say in a general sense. every circumstance is different….and then you have to consider the metrics that are applied to the quality of the image…what are the technical or artistic standards? how innovative or “perfect” is the image and does this ultimately matter as to it’s artistic “worth”? what exactly is “interesting”….to who and in what way? it gets very slippery very fast and you could talk in circles about it endlessly. if i thought about it too much i would probably stop taking pictures altogether….ha!! to use some extreme examples i would say that if an architect or sculptor took a competent picture of their own work….it would have been much more work to “create” that image than if a photographer simply took a picture of that sculpture or building (even if it was a very strong image with perfect sharpness and composition). then you have to automatically equate the amount of work with “harder”….not always the same but can be. i’ve also seen some studio work from photographers who create entire sets, insanely complex lighting set ups, fictional narrative themes, using 8X10 cameras or just 80k phase one set ups, etc in essence creating their own “world”….this is a huge amount of work, creative effort, money spent, etc. again….this again requires equating amount of work with “harder” and a creative shot of an already existing situation as “easier” because it took very little time (comparatively) to do. Hmm, most interesting. I’d like to take this idea into a different field, namely music. While I do live in Japan, I don’t generally fit the cliché of an anime nerd. That being said, I do like a few of them, and their common thread is the music, which is composed by an extraordinary woman named Kanno Yoko (Japanese style: Kanno is the family name). This lady has written an enormous amount of music for anime, commercials, etc, and a lot of it is of seriously high quality: she seems to have a near-effortless command of whatever genre she tries. However, a couple of years back, I came across some interesting articles online which demonstrated that a number of her songs showed similarities to other songs, to an extent which could certainly be considered as defining plagiarism, or at least flirting with it. There is no question that some of her melodies and rhythms are very, very close to the originals. There are enough examples to make one wonder. The thing is, though, that (to my ears) her “versions” are superior to the original material every time. This is the interesting point. I have two theories on this. One is that she simply appropriated the melody or rhythm and hoped nobody would notice. This strikes me as possible but unlikely, given the nature of the internet and how it pretty much destroys international boundaries when it comes to consuming entertainment. The other is that she writes so much music that it is inevitable that at some point she would write something close to or resembling something which has already been done. I don’t know if the truth of the matter is one, another, or a bit of both. However, I’ve noticed this with my photography too. For instance, after watching one of your videos, I find myself shooting pictures which sort of resemble (but are not as good as) yours. After watching Jay Maisel on video, I find myself shooting shots reminiscent of (but nowhere near as good as) his. And so on. I suppose that it comes down to being honest with oneself in the end. If you shoot in your own way but include, consciously or not, influence from other photographers, then I think that’s entirely fine. If you go out of your way to copy someone else with the aim of taking credit, then you might have to question your motivation for shooting. I like how your articles provoke such interesting debates. Hope you will find the time to keep writing them! Do you think they’re superior (a subjective concept), or perhaps better suited to the mood of the other content they’re paired with? It is certainly a reinterpretation, but perhaps there’s some art in knowing what pairs with what. Don’t get me wrong, I’m against blatant copying if it’s passed off as original or without attribution, but there’s nothing wrong in acknowledging an inspiration. If I remember correctly, no more than seven notes consecutively can be identical to any other piece or section of another composer’s music beford it becomes plagiarism or infringement. A case in point is milli vanilli’s famous base line, its been used in so many local and international ad jingles, but if one listens carefully the eighth note is always either lower or higher by a semitone. Even michael jackson has been embroiled in such controversy. You can’t tell me that the top image isn’t art! The deep shadows on the tall building create a visually stunning negative space in the image. Were I a betting man, I’d say that there was no way the scene looked like this when the shutter was snapped. It’s strictly the artistic vision of the photographer that made the image come to life! Well…plenty have argued with me that my work isn’t, but hey, I think it is if I intend it to be. The scene didn’t look like that through human eyes, but by changing the exposure it did…though I did have to be able to visualise that before hitting the button. Ming, your red chair reminds me of Eggleston’s “The Red Ceiling”. A really thought provoking post on an ongoing discussion, when I was studying photography 30 years ago we were having this argument. 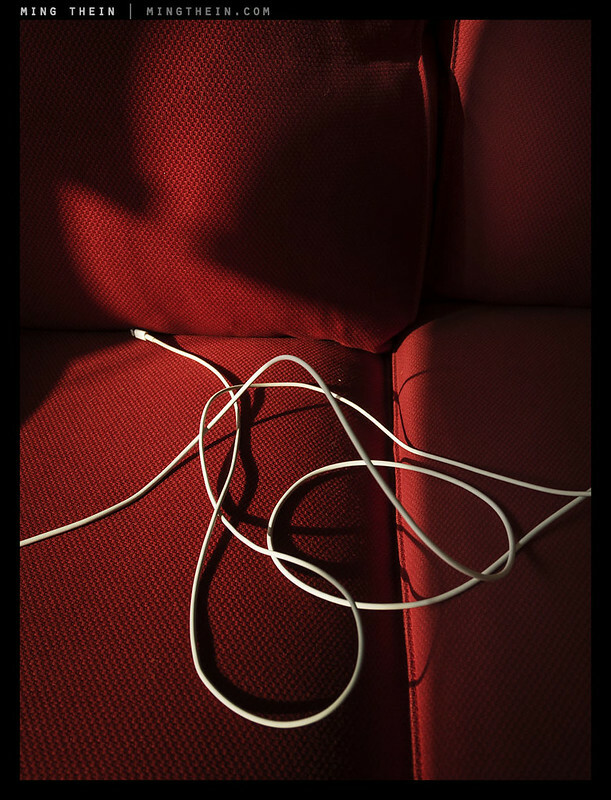 I think your image of the white cord on the red sofa might have been influenced by William Egglestone. He has an image of a light fitting in a red room. Egglestone was / is an artist with a camera and like you paid great attention to the printing process. I’ve never seen that shot until now (obviously after shooting the cord on sofa) – so what does that make it? Funny thing is I’d never seen that image until you mentioned it, and I googled it – can it still be a derivative work? Well, if you had never seen it before, all one can conclude is that you were not influenced by it. (Out of interest, it’s one of WE’s most influential images, and certainly controversial). Personally I think we are influenced more by style than content. Moments frozen in time have the ability to be original, because of the way the elements in the world come together at that moment in a unique way. The way we see them may well be a mixture of what we are trying to say, and the style or manner we say it may well be influenced by someone whose work we resonate with. The freshest work I see is sometimes with kids who have been given a camera and don’t have all the baggage and exposure to other photographers that old fools like me have. But I still think there is room for a kind of evolutionary originality that may be partly derivative but still moves art forward and pushes boundaries. I think Willam Eggleston did exactly that, for example. A lack of rules/baggage is certainly good for creativity, but it has to be balanced with the experience to know how to translate an idea. I suppose there is a sort of happy medium in which one is always experimenting, perhaps? Structurally yes, content and mood…no, I don’t think so. No. But when I saw Eggleton’s image, I recalled this one of yours. The chair resembles more I agree. In music, we do not think of anything as being a derivative work since the creative moment comes from within. I don’t suppose these words I write here are derivative works, or how about when a storyteller tells an important story. We simply create. Of course those are performance arts. I am trying to think if the “performance” of a visual art piece ends when the piece is finished. Performance art is so straight forward compared to visual art. Paintings can be reproduced yet no one claims that at that point they are no longer art. How about a photo of a painting? I was going to say at first that art requires an audience, but when visual art is being done– while it is being done- there is no audience. When the musician is playing alone, we do not call that art. Alone means practicing. Then I thought, maybe art is when something is worth saving. But no, the mere act of saving something is not art either. We save old mail, but that is not art. And we all know that the monetary value of something does not make it art. Maybe Art must be created by one person: one artist working all alone. Yet that is a hazy area, too, if we consider the breakdown of all that supports the art piece– the making of the canvas or the making of the camera we own. I’m thinking of the grey areas: photographs of buildings, which were another art form designed by an architect; an abstract image of a sculpture; a photograph of an existing arrangement. Even if we photograph a portrait, with elaborate makeup, then isn’t it a derivative work of the makeup artist? Etc. thank you… I hope that my references to other art forms seems interesting or adds a little bit to things. As a musician with only one toe in the waters of visual media now, my impression is that visual media artists are very hard on themselves. Yet the narratives that can occur are so interesting to read and more lively than in music. Once accepting that visual media artists sure are critical of everything they do, the subsequent text narratives, like this one, are fantastic. In the art world (including fine arts), I used to have a dislike of derivative works. “It has been done already, why do it again, and who would want to see it?” Then, when I took my beloved to see a stage production of West Side Story, a piece that is near and dear to here, I realized that people want to interpret classic pieces of work. The production was a bit darker than the movie, which I am sure differed from the original stage production, but that is OK. It is no different than performers doing jazz standards. If you do not like them, that is fine. But as artists, we sometimes like to create, and we sometimes like to interpret. The take away for me, is the quality of the work. I can listen to Ella sing Gershwin all day long, because her performance calls to me. I enjoy many of your images because they call to me, and as a photographer, I have some idea of the work that you put into them. I think your Ultraprints are a great example of quality and dedication. Yes, a mass audience may nto appreciate what it takes to produce them, but if you care about your work, and you value quality, are you really trying to sell to a mass audience? You may be trying to get them to see the value that you see in these prints, but that is no exactly the same as getting them to buy a print. In my line of work (that pays the bills), many people never see the effort that goes into making my projects a reality. They do not understand what it takes to successfully bring a project to fruition, so it looks effortless to them. My manager, and my colleagues, however, understand what it takes, so I have always taken heart in their words of support and congratulations. My career was a choice on my part, and I do it because I love what I do, and I do it well. 25+ years later, I have made peace with the fact that much of my world will never really understand, or truly appreciate what I do each day. I wish they did, but still I do it because I love it, and I know that it is the right thing to do, even when I in the midst of an absolutely horrible day in the office. We all want recognition (and our “15 minutes of fame”), and to some degree, we have accelerated the time frame for it as our attention spans become shorter and shorter, and as we get caught up in not just the her and now, but the instant and immediate here and now (cue up an image of a person with eyes glued to their cell phone). I would recommend worrying less and producing more, but you are among the most productive people I see on the web, so I can only advise to worry less and take comfort in the parts of your life that you have lived as you wish. If anything is too different from your audience’s experience of point of reference, they may not ‘get’ it – and I suspect this is the case with a lot of truly original art in its day; the world needed to catch up. Just look at the impressionists, for instance. There’s the 15 minutes of fame, there are our personal egos, and there’s the commercial reality that your audience/ customer/ buyer’s attention spans are ever shortening – if one doesn’t make the most of it, then there’s a good chance that opportunity may never come again. And that would be sad…but yes, you’re right: we must produce for ourselves first, and be confident/ happy that there is originality there – at least to us. Interesting/poingnant choice of lead image! 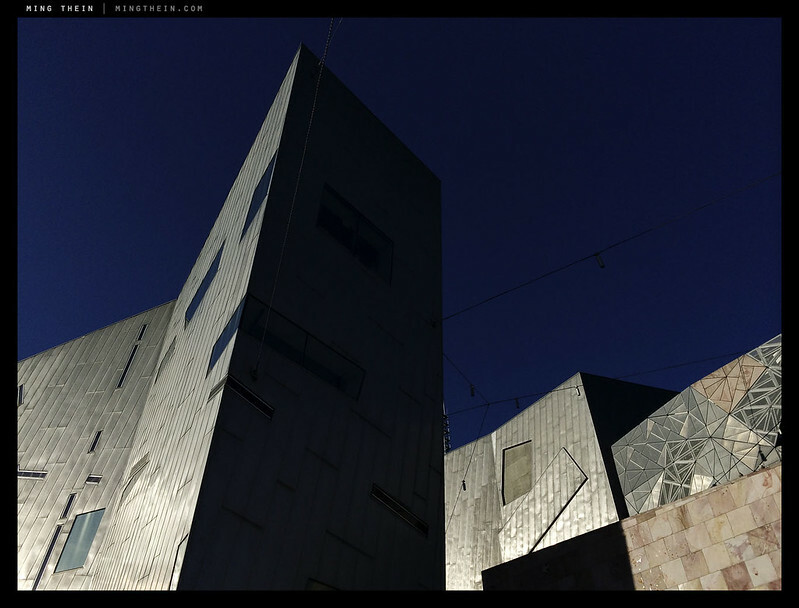 The ‘shard’ buildings in Federation Square are very derivative of Daniel Libeskind’s famous architecture of the Jüdisches Museum in Berlin. The Jüdisches Museum is one of the most impressive feeling buildings i’ve ever been inside, perfectly fit for purpose and atmosphere, and I was disappointed to see it blatantly copied in Melbourne (after I checked to make sure Libeskind hadn’t worked on that too). Is there anything that’s truly original? I’m honestly not sure…perhaps the best we can do is find a mix of inspirations rather than a single one, which would then come across as copying.